At 4 Paws Veterinary Care, we understand that it can be frightening to receive the news that a dog surgery is being recommended. It is important to understand that it is a recommendation that our veterinarians do not take lightly. If one of our veterinarians is recommending a surgical procedure, rest assured that it is with the best interest of your dog in mind. It is important to us that you understand the reasons as to why a surgical procedure is being recommended and are able to comfortably make the right decisions regarding your dog's health. Surgical attire. Staff must wear disposable caps and masks when entering the surgical suite. Anyone involved in the procedure itself must also wear sterile gowns and single-use sterile gloves. 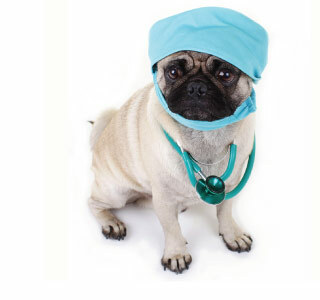 At 4 Paws Veterinary Care, we adhere to very stringent guidelines for administering dog anesthesia before, during and if necessary, after surgery. Suture care (stitches): Most surgeries will require some sutures. Your veterinary staff will review with you the after-care which will include keeping your dog from licking the incision.